The Say Your Prayers command takes more than one action. Teaching him to stop is the easiest part. Start by commanding your dog to sit facing a chair or low bed, depending on your dog's size. Hold a treat at the edge of the bed or chair. Say Up and pat the edge of the chair or bed, demonstrating where you want your dog to raise his feet. Your dog will probably try to jump up on the bed. Say Aah-aah and gently guide him back down. Repeat until he understands that you want only his feet up. When he accomplishes this successfully, praise him, and reward with the treat. 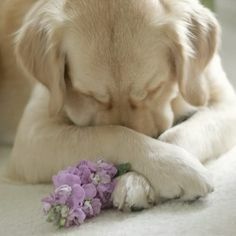 Give the Stay command, and tell your dog to Say Your Prayers. To get your dog to bow his head, lower the treat between his front paws. Praise him and reward him with the treat. To teach your dog when to stop, the perfect command to use is Amen. .Keep in mind that behavior rewarded with praise and treats is more likely to be learned. This trick is more challenging than most to phase out the treats. If you start naming the trick just before the food appears between his paws, he will begin Saying His Prayers without treats in no time.